The largely impenetrable layers of history and how we humans are so prone to repeat past mistakes. That is what occurs to me today as I walk these ancient paths and sit beside an ancient, pagan well of healing—mineral waters—overlaid, of course, by Christian (Saint Bernard) and ancient Greek (Hygieia) symbols. After a morning of reading ancient British Poor Laws—weeks of researching them and tracing their repercussions today, not only in the U.K. but also in the U.S. and in Seattle/Washington State. The worthy and unworthy poor. The deserving and underserving poor. The impotent poor. Paupers. Vagrants. Ruffians. Charity and its attendant ills. Solidarity and its limitations. Why aren’t nurses taught more about the history of social welfare and of the legacies of ancient pauper laws? Are they taught that at all here in Scotland or elsewhere in the U.K.? How much of it are even social workers taught either here in the U.K. or back home in the U.S.? It seems so important and puts many things in perspective, especially in terms of addressing the current thorny question, “What to do about the homeless?” And my own ongoing work in the vicinity of that question. I almost feel cheated in not having known about it much earlier in my life and my career as a nurse. The deep layers of the histories of places and peoples are important to acknowledge, to know, at least at some more than superficial level. Is this something that can only be appreciated as one ages and takes on a proper sense of time? A beechnut exploded, scattered on the ground along the river walk path wending its way beneath an old tree. They look like flowers but are hard. I try to press one between these pages and it breaks through the paper. Only the seeds remain. “Health is politics by other means,” asserts Columbia University professor of sociology Alondra Nelson in her fascinating book Body and Soul: The Black Panther Party and the Fight Against Medical Discrimination (Minneapolis: University of Minnesota Press, 2011). Nelson acknowledges that her statement is inspired by French philosopher and scientist Bruno Latour’s assertion that science is politics by other means. For anyone who ever doubted either of these assertions—or thought they were alternative facts—you must live in the Land of Narnia. Before reading Nelson’s book I knew that Black Panther Party for Self Defense had created community-based primary care health clinics in many major U.S. urban areas in the late 1960s/early 1970s. But I did not understand the true breadth of their healthcare activism. I worked as a nurse practitioner for about six years at Seattle’s Carolyn Downs Family Medical Clinic , originally formed in 1968 as a Black Panther clinic. It is located in the Central District of Seattle, a traditionally black neighborhood that is now significantly gentrifying. It is named after an early Black Panther community organizer, Carolyn Downs, who died at an early age of breast cancer—something that most likely could have been detected and more effectively treated if she had had better access to the primary care now provided by the clinic she helped develop. A highlight for me of working at Carolyn Downs Clinic was being able to care for one of Carolyn’s granddaughters. The Black Panther Party for Self Defense was formed in Oakland in 1966 as a survival tactic “to afford protection for poor blacks from police brutality and to offer varied other services to these same communities.” (pp. 5-6) These services included the establishment of no-cost community-based primary care clinics, sickle-cell and blood pressure screenings, free breakfast programs for children, and after-school and summer tutoring programs. They also formed teams of patient advocates who accompanied their patients to hospitals or specialty care, heralding our current system of patient navigators. The Black Panthers were also instrumental in challenging the formation of the Center for the Study and Reduction of Violence at UCLA, a research center backed by the California governor Ronald Reagan, and which promised to find the origins of violence. It was to be headed by psychiatrist Louis Jolyon West, whose previous research included experiments with sleep deprivation, LSD, and correlating the era’s student activism with antisocial behavior. (pp. 153-154) The Black Panthers contended that aggression for people within marginalized communities was a legitimate response to oppression. They, along with many other activists, were successful in blocking funding for this center. The Seattle Black Panther Party History and Memory Project, part of the University of Washington’s Seattle’s Civil Rights and Labor History Project, led by UW professor of history James Gregory—contains videotaped oral histories, historical photographs and news coverage and more. Untitled, oil on canvas. Erika Kahn. Photo credit: Josephine Ensign/2017. These dark, uncertain times demand our full attention, compassion, and capacity to endure beyond what we previously thought we could endure. And by this I do not mean passive suffering or some sick, masochistic hair-shirt sort of endurance. Nor do I mean resilience, the saccharine notion that the human body, the human psyche, and even entire communities (or countries) can be like heated metal—stressed and stretched but not broken—that they can bounce back, return to steady state, and perhaps be stronger and wiser for the experience? Trauma never happens in isolation. An individual trauma ripples outwards as well as inwards. Suffering from trauma is always a social process; recovering from trauma is always a social process. Resilience, either from an individual or a community (or country as we are now facing), even if it were possible, would it be desirable? If most traumas, most disasters, are at least partially caused by and certainly compounded by social (in)justice issues, do we want to return to normal, to the status quo after our worlds, our bodies, our communities have been shaken to the foundations, have been seared by fire, have been permanently altered and scarred? Skirting close to the danger of glorifying trauma, of feeding an addiction to the pain and suffering so overly abundant in our world, is the recognition that individual and community healing “means repair but it also means transformation—transformation to a different moral state.” (2) And it means enduring, going on, doing what we can individually and collectively to transform the world for the better. Adapted from my book manuscript for Soul Stories: Voices from the Margins. Paul Farmer. “On suffering and structural violence: a view from below.” In: Violence in War and Peace. Edited by Nancy Scheper-Hughes and Philippe Bourgois. (New York: Blackwell Publishing, 2004). pp 281-289. Quote is from p. 288. See also: Arthur Kleinman, “The art of medicine: how we endure” The Lancet. January 11, 2014. Vol 383. pp 119-120. My essay, “Listen, Carefully,” was published today by Electric Literature/Okey-Panky. I love the Okey-Panky tagline, “Literary oddments for busy people.” They state that my essay (or is it really a prose poem?) is a 4-minute read. It includes a link to my 7-minute digital storytelling video of my reading of the piece, accompanied by my photographs. 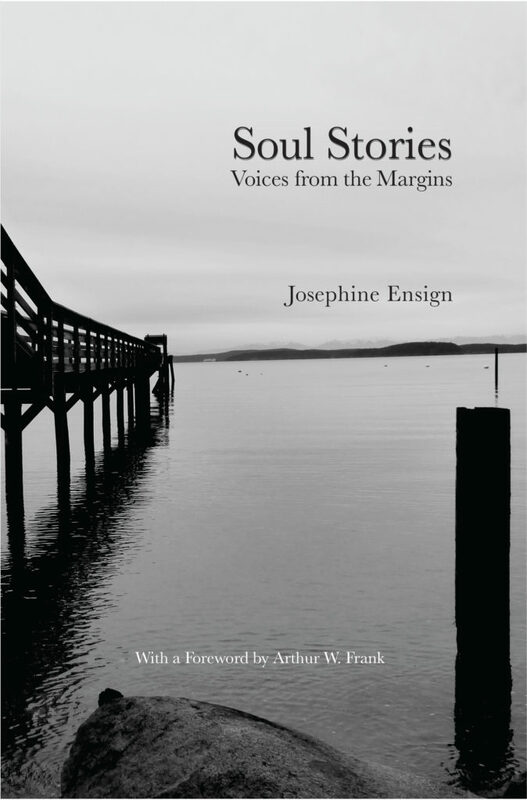 “Listen, Carefully” is part of my book and digital humanities project, Soul Stories: Voices from the Margins. In “Listen, Carefully” I parse out some of my criticisms of the practice of narrative medicine, as well as the rhetoric of listening—and of silence. “I write about what most fascinates me right now,” said John McPhee, by way of Robert Michael Pyle, both amazing trail-blazers, or perhaps trackers, of that strange beast that is creative nonfiction. McPhee has written books on subjects such as oranges, the island of his Scottish ancestors, family doctors, college basketball players, the shad as Founding Father fish, and the history of the birch-bark canoe (my personal favorite). Pyle, who is also a biologist, a lepidopterist (butterfly expert), and founder of the Xerces Society for invertebrate ecology (saving our butterflies and bees), has written about butterflies and trees and Big Foot and life. My favorite contemporary female trackers of, or perhaps more fittingly, expanders of the boundaries of creative nonfiction are Terry Tempest Williams and Rebecca Solnit. When Women Were Birds: Fifty-Four Variations on Voice (New York: Farrar, Straus, and Giroux, 2012) by Williams and A Book of Migrations (London: Verso, 211) by Solnit remain two of my all-time favorite books. Each of these great writers of creative nonfiction sweep us along on explorations of their own current fascinations, obsessions, questions–the pebbles in their shoes, as one of my writing mentors, Stephanie Kallos puts it so aptly. What is it that you carry with you, that at each step insistently reminds you of its existence? The pebble of obsession doesn’t have to be a large rock-sized, inscribed with the muse-whisperer one as shown in the photo here (my historian son made that for me a few years ago–coolest present ever!). But is should be of sufficient significance to be likely to matter to other people besides yourself. But who would we be, as individuals, as a society, if we didn’t even try? That is the core question, the obsession, the pebble in my shoe.